Darrell Katz’ compositions unfold like suspense films, pregnant with anticipation, marked by unexpected twists and turns and exotic panoramas, packed with glorious collisions, barely skirted disasters and triumphant comings-together. You may indeed hear textures and harmonies reminiscent of the sounds injected by big-band composers and arrangers into Hollywood scores in the 50s and 60s, bringing jazz rhythms into soundtrack music while taking extreme liberties with the conventions of jazz as dance music through the use of 20th century classical devices. These writers travelled a different route out of swing and the American popular song than did such core jazz innovators as Ornette Coleman and Charles Mingus – whom Katz cites as among his major influences – but took equal advantage of the opportunity to broaden the palette of jazz. 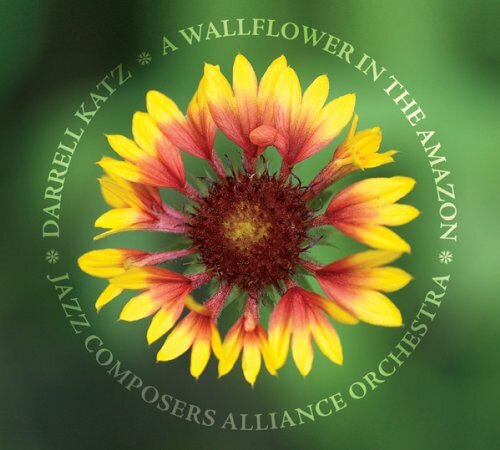 In the work of Katz and the Jazz Composers Alliance Orchestra, these two currents flow together in a way that highlights what 21st century jazz musicians can do. The musicians display the lightning comprehension, broad ensemble perspective and razor sharp precision of studio cats while remaining continuously ready to turn left into the post-free jazz, any-parameter-for-improvisation-goes world of now. Spectacular crystalline ensemble textures dissolve in high-energy jazz bashes and re-emerge, transformed, on the other side. Many of the key JCA players are significant bandleaders and composers in their own right, whose ensemble vision equips them with the necessary tools. Members range from Jim Hobbs (of the free-swinging Fully Celebrated trio) to Phil Scarff (of the Indian-jazz quintet Natraj) to Allan Chase (whose credentials run from vintage cool to post-Coltrane) – and that’s just 3/5ths of the woodwind section! Other players include top call trumpet players Mike Peipman and Gary Bohan; fire breathing trombonists David Harris and Bob Pilkington, venerable educator and low brass specialist Bill Lowe, Either/Orchestra drummer Pablo Bencid and many others, equally talented. Extraordinary vocalist Rebecca Shrimpton mirrors the band, displaying the ability to sing complex extended melodies with a relaxed jazz feel and to make lyricist Paula Tatarunis’ free verse sound conversational. As if Katz and the JCA aren’t juggling enough elements, Wallflower also dredges the grittiest of blues, as embod- ied by singer/organist Mike Finnegan, featured on a fractured Hoochie Coochie Man and a somewhat more conventional Tuff Luck Blues. Finnegan has an astonishing list of credits including work with Jimi Hendrix, Joe Cocker, Etta James, Crosby Stills and Nash, Dave Mason, Buddy Guy, Manhattan Transfer, Taj Mahal, Michael McDonald, Maria Muldaur, Peter Frampton, Cher, Ringo Starr, Leonard Cohen, Tower of Power, Rod Stewart, and Tracy Chapman. The coda to the album here is The Red Blues, a haunting, bluesy ballad featuring Shrimpton and the JCA Sax Quartet, dedicated to one of Katz’s favorite musicians Julius Hemphill. The Jazz Composers Alliance was founded in 25 years ago to support, develop and promote the art of music composition in the jazz idiom. The Jazz Composers Alliance Orchestra was founded to help realize that goal, and it has been a fixture on Boston’s creative music scene since its first performance in December 1985. The JCA has released 7 critically acclaimed CDs. The group has performed (and on a few occasions, recorded with) an illustrious group of guest performer/composers, including Sam Rivers, Julius Hemphill, Dave Holland, Maria Schneider, Henry Threadgill, Steve Lacy and Oliver Lake. Drawing on influences that span the history of jazz and the world’s musical traditions, the JCA Orchestra has brought together a huge palette of sounds, struc- tures and concepts.